April 8, 2016 by Dr. Jessica Barron, D.M.D. As with any medical appointment or procedure, it’s important to understand your options so you can make an informed decision. Here are just some of the top dental questions we get asked most frequently. We work with a range of insurance plans to help you manage the cost of dental services. While Barron Family Dental does not currently take Medicaid or HMOs, we are continuously updating and expanding our insurance plan coverage. We do offer a discount plan for patients that don’t have dental coverage, so if you are interested in becoming a client at the Barron Family Dental practice, please contact us at (303) 284-6463! We would love to work with you to outline procedures and treatments that may be appropriate and costs so you can enjoy the best smile possible. Is it going to hurt at my visit with the dentist? This is a common and understandable question. While you may be uncomfortable with the thought of visiting the dentist or having a procedure, you should be aware that most treatments cause no pain and, in many cases, the treatment itself will relieve pain. At Barron Family Dental we understand and encourage you to feel comfortable talking about any concerns. Ask for information about how long any procedure, even a cleaning, will last and what is going to happen. Just knowing what to expect is often enough to avoid any unnecessary anxiety. Lastly, we offer a relaxing environment for all cleanings and treatments, including movies and TV shows you can watch, using the latest technology for the most efficient service. Do I really need an injection or shot? There are many different options to deal with discomfort or anxiety during your dental visit. Options exist to control pain, others help you relax, and there are alternatives for complete sedation during some treatments. Local anesthesia, often in the form of an injection, is used to prevent pain in a specific and localized area in the mouth during treatment. Most people don’t even feel an injection, however, because a topical anesthetic is used first to numb the area for the injection. If you have a treatment scheduled, please talk to us about your options. We want you to have a safe and positive experience, and we’re trained to work with you to make this happen! Unfortunately, as with most medical situations, if you choose not to treat the problem, the problem will almost certainly get worse. A cavity that goes untreated, for example, will continue to grow in the tooth and can destroy the tooth or get infected. If you have a tooth that is missing and not treated, invariably your remaining teeth will shift or spread out to fill the gap. Similarly, if you need teeth extracted but you don’t address the resulting gaps, this can result in bone loss and unnecessary wear-and-tear on the remaining teeth. Studies have also shown that the mouth is the gateway to the whole body’s health, so keeping it clean is important. If you need a dental procedure or even regular cleaning and checkups, choosing not to do anything may lead to disease, discomfort, and a worse situation than was ever necessary. Regular checkups and a good relationship with your dentist are ways to plan and prepare for any oral health issues before they become a problem. We love it when patients ask this question! There are many options to improve the shape, color, and shape of your teeth. We offer a range of cosmetic dentistry options that are gentle and highly effective. Patients consider porcelain veneers, which are a fast and permanent solution to improve the shape, color, and overall appearance of teeth. Teeth straightening options are available, including the virtually invisible Invisalign® braces that correct crossbites, spacing, and rotation of teeth. Crowns and bridges provide terrific results for missing or damaged teeth. At Barron Family Dental we also offer professional teeth whitening using a proprietary whitening blend for sensitive teeth and with options to whiten teeth at home or quickly in the office. Why can’t I have a filling instead of a crown? A crown, also known as a cap, helps restore a decayed, cracked, or broken down tooth. The goal of having a crown is to protect the remaining tooth structure. If a crown is needed, it’s because the tooth is severely broken and there isn’t enough tooth structure remaining for a filling. Fillings are designed to fix part of a tooth but aren’t used to repair cracks, extensive decay, or damaged teeth. If a crown is recommended, it’s best to have it fitted as soon as possible to avoid any further breakage or for an infection to develop. Root canal therapy is a relatively painless procedure and actually relieves the tooth pain a patient is experiencing. If a root canal is necessary, it simply means the tooth’s root is infected due to a cavity or trauma. The aim of a root canal procedure is to save the tooth through a straightforward, deep cleaning procedure of the canal area. While the term may make patients uncomfortable, be assured that this standard procedure will both relieve the painful symptoms and save a tooth to avoid having an extraction and a new tooth put in place. There are several options to replace a missing tooth or teeth – and it’s worth considering, so that other teeth don’t shift and move, to improve your ability to chew and speak, and make you feel more confident with a great smile. Our patients consider implants, for a single or several missing teeth, where the tooth is anchored and colored to match naturally remaining teeth. A dental bridge is another option where an artificial tooth is used to fill a gap. There are several different bridge options available, including some that are removable and others that are bonded to remaining teeth. All provide great aesthetic coverage to improve your smile. Many of our adult patients are looking for treatment to straighten their teeth because you’re never too old to improve your smile! The days of full metal mouth braces are gone and with so many options of teeth straightening there’s never been a better time to consider Invisalign. 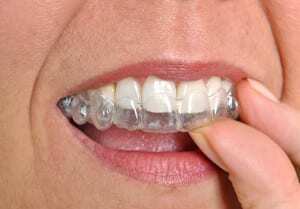 Invisalign is a custom-fitted, clear mouthpiece that you wear most of the day. They are removable for eating, cleaning, flossing, and brushing teeth and are so transparent, often it’s difficult to tell someone is wearing them! No matter the type of treatment, the results of straightened teeth are remarkable for our patients. Do you have other questions? Are there treatments you are considering or improvements to your teeth you’d like to make? Barron Family Dental is here to answer your questions and provide the best service to ensure a healthy smile for you and your family. 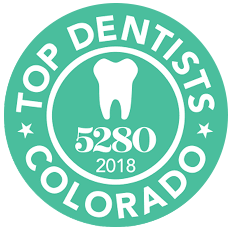 Call us at (303) 284-6463 or make an appointment online to visit us for your dental needs.